Yahoo movies has just released the new trailer for Dr Seuss' The Lorax. With every trailer we get to see more and more of the film. With that it also seems to be getting better and better. 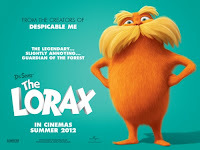 The 3D-CGI feature Dr. Seuss’ The Lorax is an adaptation of Dr. Seuss’ classic tale of a forest creature who shares the enduring power of hope. The animated adventure follows the journey of a boy as he searches for the one thing that will enable him to win the affection of the girl of his dreams. To find it he must discover the story of the Lorax, the grumpy yet charming creature who fights to protect his world. Danny DeVito will lend his vocal talents to the iconic title character of the Lorax, while Ed Helms will voice the enigmatic Once-ler. Also bringing their talents to the film are global superstars Zac Efron as Ted, the idealistic young boy who searches for the Lorax, and Taylor Swift as Ashley, the girl of Ted’s dreams. Rob Riggle will play financial king O’Hare, and beloved actress Betty White will portray Ted’s wise Grammy Norma.